The Warehouse Arts District of St. Petersburg is home to numerous artists and art spaces, including our gallery and hot glass workshop. This area was once mostly industrial, dominated by warehouses and manufacturing companies, but has become an epicenter of St. Petersburg’s vibrant and growing art community. The district runs between 1st Avenue North and 10th Avenue South, and 16th Street and 31st street, easily accessible via I225. As the presence of manufacturing and industry in the area declined over the last couple of decades, artists were attracted to the district because of large warehouse spaces available for inexpensive rent. In 2011, a group of artists who had moved to the district met to discuss how they might pool their resources and facilitate the growth of the burgeoning art community. From these initial meetings grew the Warehouse Arts District Association (WADA), which was incorporated as a 501C3 nonprofit with bylaws and a mission statement. As tends to happen, the growth of the art community in the district attracted quite a bit of interest to the area, bringing a greater audience to the artists – but also increasing the cost of gallery and studio space. In an effort to address this concern, WADA sought to purchase warehouse space to provide artists with affordable options. In 2012 they began a capital fundraising effort, with plans to purchase 50,000 of warehouse space. Through public and private fundraising, including a $75,000 donation from the City of St. Petersburg, WADA raised $350,000 for the down payment on a compound of six warehouse buildings, which became the ArtsXchange. The Second Saturday Art Walk is popular monthly event that has helped the growth of St. Petersburg’s art scene, and the Warehouse Arts District has developed into a large part of the event. On the second saturday of each month, more than 50 galleries and studios stay open after hours, welcoming thousands of people to openings and special events. 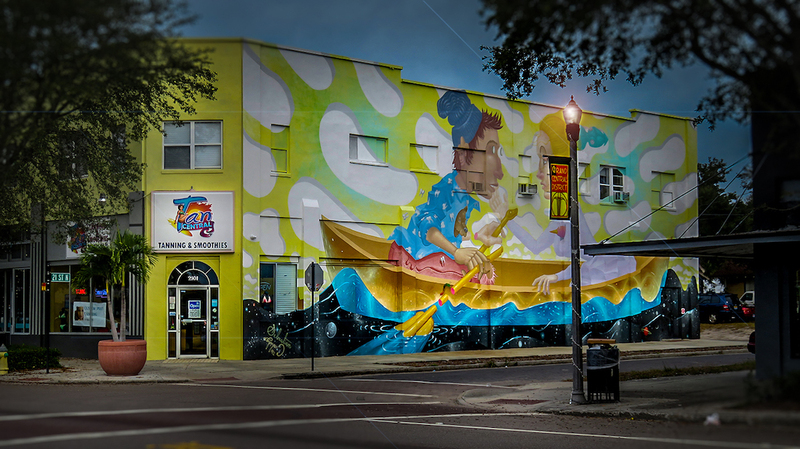 If you are visiting St. Pete, or you’re local looking to experience more of your city’s vibrant art community, come see all the Warehouse Arts District has to offer.